The head of Iraqi Turkmen Front Salihi said the Turkmen security force should cover the entire Turkmen region. Iraqi Turkmen Front (ITF) head Arshad Al-Salihi evaluated the plan for setting up a Turkmen security force which was high on the agenda after rising terrorist attacks targeting Turkmens, and said that such a force should cover not only Tuz Khurmatu district of Saladin city but also regions whereTurkmencommunities were living, and especially Kirkuk. Tuesday’s attack was noted as one of the biggest ones targeting Turkmens in the last two years. Deputy head of Iraqi Turkmen Front Ali Hasim Muhtaroglu lost his life in a suicide attack in Tuz Khurmatu. Two suicide bombers had detonated the bombs on their bodies killing 13, and wounding 71 people. Thereupon, Salihi evaluated the plan for founding a Turkmen security force in Iraq after the rise of the attacks targeting Turkmens. ITF has been discussing about how to form Turkmen security force and how to describe the realm of authority with where to cover as local security forces to protect Turkmens who were targeted by attacks in Iraq. 27 June 2013 – Welcoming progress on resolving pending issues from Iraq’s 1990 invasion of its smaller neighbour Kuwait, including finding Kuwaiti or third-country nationals, the United Nations Security Council today eased some of its sanctions against Iraq. The Turkmen in northern Iraq have reacted in terms of the attacks which targeted the Turkmen in Tuzhurmatu city and most recently the attack which resulted in the murder of the Deputy Head of the Iraqi Turkmen Front (ITF) Ali Haşim Muhtaroğlu. The Turkmen who are reactive towards the Iraqi central government in this issue demand that primarily Turkey, the United Nations and human rights groups remonstrate the Baghdad government which is responsible for the life safety of Turkmen. The Turkmen claim that the Iraqi government has failed to take necessary measures and emphasize that although over 500 Turkmen have been killed in over 30 attacks to date such attacks will not intimidate them and make them forgo their cause.The Turkey Representative of the Iraqi Turkmen Front Hicran Kazancı also reacted against the attacks executed in Iraq yesterday. Kazancı organized a press conference with the participation of Head of Turkmeneli Party Riyaz Sarıkahya, Head of Turkmeneli Culture Center Mustafa Ziya, Head of Turkmeneli Cooperation and Culture Foundation Fatih Turkcan at the headquarters of the ITF in Ankara and voiced their reactions and demands. En Irak les Turkmènes (l’une des trois ethnies principales du peuple irakien, la seule qui ne possède pas de milice armée) sont continuellement agressés par ceux dont l’objectif est de s’approprier la région turkmène (TURKMENELI) riche en ressources naturelles. Les intellectuels et les politiques turkmènes sont particulièrement visés. Au cours des derniers mois le nombre d’attentats meurtriers à l’encontre des Turkmènes n’a cessé d’augmenter, causant la mort d’un nombre élevé d’hommes, de femmes et d’enfants et la destruction de maisons et commerces appartenant aux turkmènes dans le nord de l’Irak. Les milices arabes et kurdes (peshmerga) ne font RIEN pour protéger la population turkmène qui est particulièrement vulnérable et le gouvernement central (Bagdad) fait la sourde oreille lorsque les responsables turkmènes demandent la formation d’une milice armée composée de jeunes turkmènes pour protéger les habitants des régions et quartiers turkmènes. Sans armes les Turkmènes continueront à être victimes d’EPURATION ETHNIQUE, le gouvernement irakien étant incapable d’assurer leur protection. THE ETHNIC CLEANSING OF IRAQI TURKMENS CONTINUES. 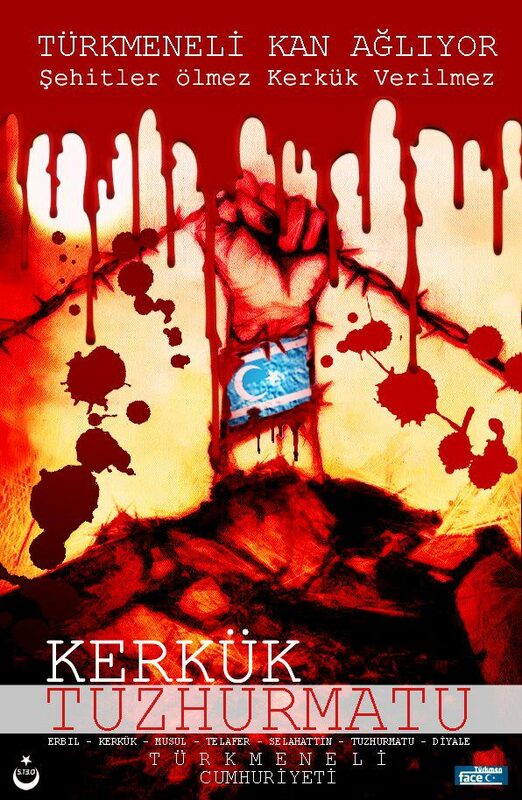 Turkmens are targeted every day. Where are the voices of the HUMAN RIGHTS ACTIVISTS? Where are the voices of those who say they care for Iraq and its people? Why this DEADLY SILENCE when it concerns Iraqi Turkmens ? 25 juin 2013 – Le Représentant spécial des Nations Unies pour l’Iraq, Martin Kobler, a vigoureusement condamné mardi l’attaque contre des dizaines de manifestants turkmènes dans la ville de Tuz Khurmatu, faisant plusieurs morts et blessés. Cette attaque a eu lieu alors que les manifestants, notamment deux responsables de premier plan, Ahmed Abdel-Wahed et Ali Hashem Mukhtar Oglou, demandaient plus de sécurité. « De telles attaques visent à exacerber les tensions dans la région de Tuz Khurmatu, qui est déjà particulièrement sensible », a poursuivi M. Kobler, qui a appelé tous les dirigeants iraquiens à assurer la protection des communautés et à prendre les mesures nécessaires afin d’apaiser les tensions. Le Représentant spécial a, enfin, réitéré sa condamnation de toutes formes de violence et exprimé ses condoléances aux familles des victimes. ANKARA (AA) – Turkish Ministry of Foreign Affairs condemned the terror attack at the Saladin province in Iraq on Tuesday. Two Turkmen leaders from Tuzhurmatu district were martyred. 25th June 2013 An explosives attack took place in the area where citizens had demonstrated against the deterioration of the situation in Tuzhurmatu district recently. A suicide activist mingled among strikers in Tuzhurmatu and detonated the explosives on his person. 30 persons were injured while numerous citizens including Deputy Head of the Iraqi Turkmen Front Ali Haşim Muhtaroğlu and former deputy governor of Salahattin Ahmet Abdülmecit Koca lost their lives. 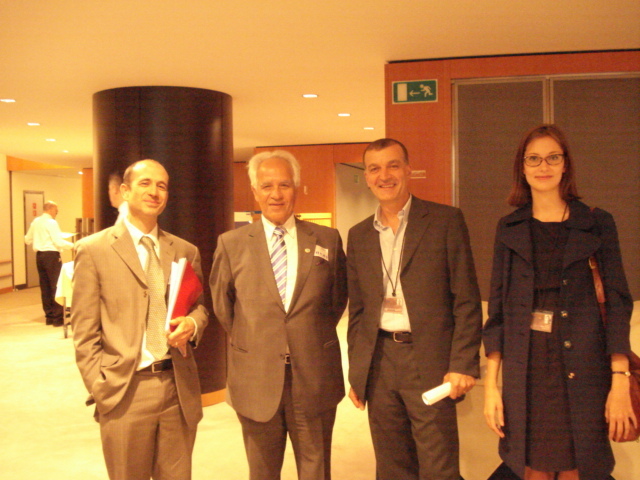 EU Parliament Brussels, 20th June 2013 – The object of the meeting was to discuss “the situation of ethnic minorities and religious groups in Iraq”. Representatives of the main Iraqi ethnic and religious groups attended the meeting, as well as representatives of several NGOs. The Meeting was chaired by MEP Struan Stevenson. MEPs (Struan Stevenson, Ana Gomez and Bert de Belder) and EEAS Desk Officer for Iraq (Ms Thisvi Ekmektzoglou) who attended the meeting said it is imperative that the rights of ALL ethnic and religious groups are respected in Iraq and they deplored the continued targeting of the minorities inside Iraq. EU representatives will continue to meet with the Iraqi government representatives in Baghdad and with the KRG representatives in Erbil to ensure that none of Iraq’s minority ethnic/religious groups are discriminated and also to put pressure on the authorities in Baghdad and Erbil to take urgent steps to provide security for the vulnerable ethnic and religious minorities.